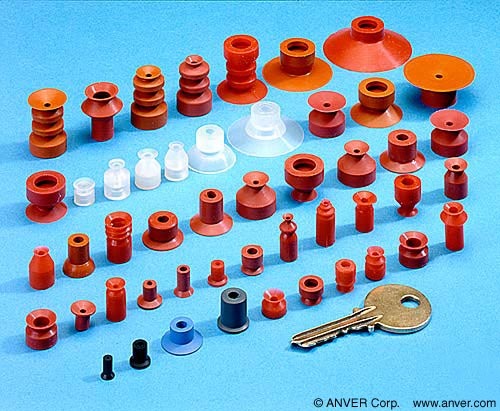 In addition to our general purpose vacuum grippers, vacuum cups and suction cups, ANVER offers an extensive line of small vacuum cups and suction cups for end-of-arm-tooling. These are well suited to the automation and handling processes of high technology industries, including plastic injection molding sprue picker robots etc. Type, size, shape and material are strictly determined by the end process use. Many of the cups listed below will interchange with other manufacturers’ products. The -ESD cups on this page are molded from Electro-Static Dissipative NOMASTAT® material. We have more information on materials here. For cups with diameters smaller than 15.7mm, click here, and for cups with diameters larger than 40mm, click here. For example: ANVER vacuum cup number F52 has a rated capacity of 15.10 lb at 24″Hg. The pull-off capacity at 27″Hg for this cup would be 15.10 x 2 x 1.25 = 33.79 lbs. From this point, it is necessary to calculate the safety factor based on the vacuum level being used, and the altitude.